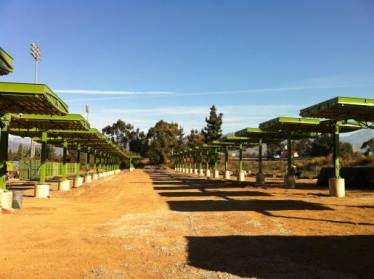 In August of 2011, the McKinley Children’s Center in San Dimas, California broke ground on a 496 kW solar power generation project. 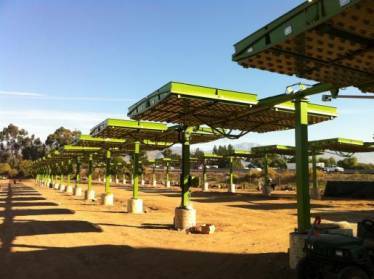 The project consisted of the construction and installation of thirty one 16 kiloWatt CPV solar arrays. Instead of the usual stationary arrays, the project used motorized panels able to tilt and track the sun throughout the day. This required the arrays to sit on extended height columns, which in turn required longer than typical anchor bolts. The contractor performing the installation of the arrays called on Portland Bolt to provide these anchor bolt assemblies. Portland Bolt manufactured nearly 1,200 custom galvanized F1554 Grade 55 anchor bolt assemblies for the project, shipping the first 500 assemblies to the job in just over a week’s time to help keep the project on schedule. Our in house galvanizing line and our large steel inventory were two of the reasons that we were able to manufacture these special anchor bolts so quickly. The completed solar arrays are expected to generate up to 75 percent of the power requirements of the McKinley Children’s Center’s 40 acre campus, which provides special-education, mental-health treatment, and adoption services to over 1,000 disadvantaged children each year through its various programs.